I’ve never made—or for that matter, eaten or even seen in real life—popovers, and this morning felt like the right time to rectify that. 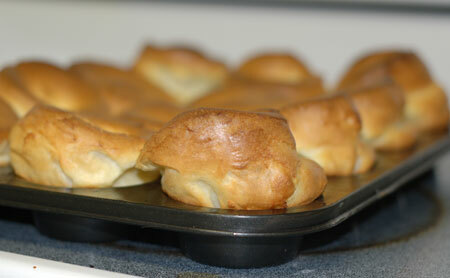 I used the recipe in the King Arthur cookbook, which didn’t require a special popover pan. I just used a standard metal muffin tin and mixed the batter with my immersion blender in a batter bowl, since my normal blender had an unfortunate encounter with the floor that left it a broken shell of its former self. My finicky oven continues to mess with me. I turned it on to preheat for the popovers—twice—and it turned itself off both times. Third time was a charm, but the whole thing was odd and made me really nervous. 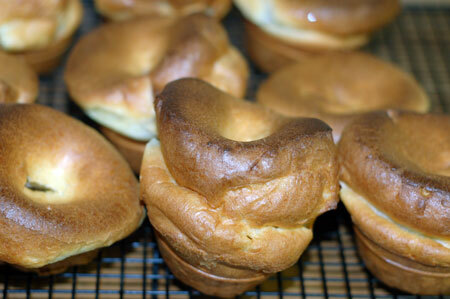 Popovers aren’t exactly forgiving about the whole temperature thing. Anyway, they came out beautifully browned and puffed and all hollow in the middle, which I think is just how they were supposed to be. I had a hard time getting half of them out of the tin, but the second half all came out without a hitch, which seems a bit suspect, as the pan was evenly greased. We ran out of margarine and haven’t had a chance to get to the store yet, but that just gave us an excuse to use real butter instead. Jeremy filled his up with strawberry jam, and I sampled cherry jam, honey, and Nutella. Place all of the ingredients in a blender in the order indicated above. Blend for 30 seconds, stopping midway through to scrape down the sides of the blender. Allow the batter to rest for 15 minutes. Using solid shortening or a nonstick vegetable oil spray, thoroughly grease 12 muffin cups (or 6 popover or 12 mini-popover cups.) Be sure to grease the area around the cups as well as the cups themselves. Fill the cups about two-thirds full with the batter. Bake for 20 minutes, then reduce heat to 350F and bake for an additional 10 minutes. Resist the urge to open the oven door at any time during this process. 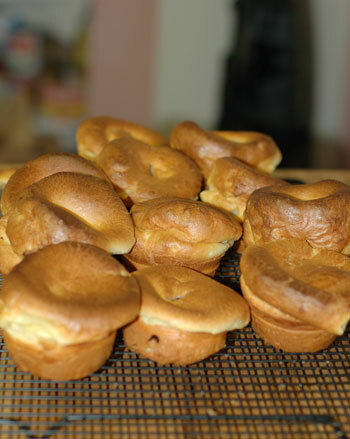 Remove the baked popovers from the oven, pierce the tops with a knife and allow them to cool in the pan for 5 minutes. Then gently turn them out of the pan onto a wire rack. Serve.